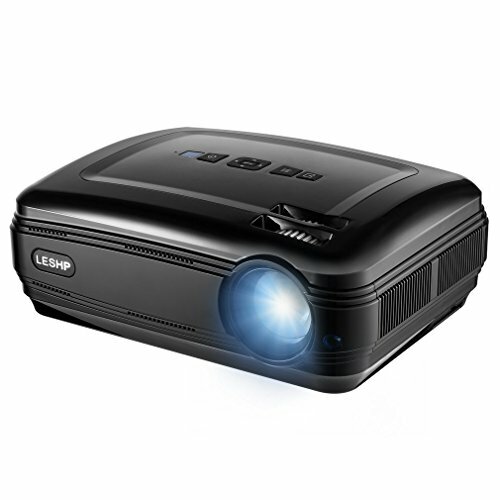 SUPER HIGH BRIGHTNESS AND 1080P IMAGE PROJECTIOM: With 5.8 inch LCD * TFT LCD panel, this projector adopt the lasted upgraded LED technology provides 20% more brightness than ordinary LED projector with 3200 ANSI Lumens.（LED lamp can work for 20000+ hrs，and can contact us to purchase replacement bulk) A 3000:1 contrast ratio;Native Resolution:1280*800; Aspect ratio:16:9/4:3. Electronic Zoom:Ideal for home theater movies and video game picture present. LARGE SCREEN EXPERIENCE: Relax your eyes from TV, Smartphone and PC，it supports projection size from 32 to 200 inches, and the best projection distance is about 3.8m(1m-6m）. Four Projection Method: Front on Desk, Rear on Desk, Front on Ceiling, Rear on Ceiling (Four mounting screw holes are cover by silicone plug on the bottom). Let you and your family enjoy large projector screen experience. 6-MONTH WARRANTY & 100% CUSTOMER SATISFACTION :Home projector comes with a full 6-month warranty. A replacement or a full refund is available for you within warranty. Please contact us if you have any question about the projector, you will get a BEST solution.